The Loy Krathong Festival is one of the most colorful Thai festivals celebrated nationwide. Processions of beautiful girls dressed in traditional costumes carry floral floats that are floated on rivers and lakes. 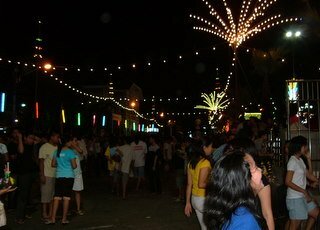 Each province has its special features in celebrating this annual Festival of Lights. 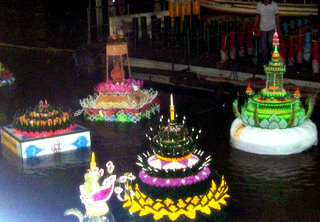 In Bangkok the highlight of the Loy Krathong Festival was a procession of boats from the Royal Thai Navy decorated with various designs and lights presented by various organizations held nightly from 13 – 16 November 2005. It was a spectacular floating kaleidoscope flickering in the night along the Chao Phraya River from the Taksin Bridge to King Rama VIII Bridge against a backdrop of historical monuments lighted up for the occasion. What's the significance of this festival beyond the color and pageantry? The Loy Krathong Festival is a 13th century Sukhothai tradition of Brahmin origin, adapted to Buddhism, to give thanks to the Goddess of water and to seek forgiveness for past misdeeds. Held on the 15th night of the new moon in the twelve-month of the Thai calendar, the festival usually falls in the third or fourth week of November. Courting couples float off a krathong together under the full moon and watch as the krathong drifts towards the fulfillment of their dreams. 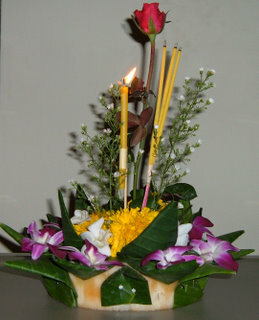 Made entirely from natural material, traditional krathongs consist of a small slice of banana trunk to serve as the float, which is decorated with banana leaves, multi-colored orchids, lotus and bright yellow marigolds, a candle and three joss sticks. In the old days, sharpened wooden slivers are used to pin the leaves. Nails and staples have replaced these today. It's customary to leave some coins and a strain of your hair in the krathong to bring in good fortune and carry away the bad. Locally Loy Krathong is celebrated at various locations near the Chao Phraya River, which are buzzing with activity, heightening as one reaches the riverbanks. Roads to the piers are filled with vendors and buskers as crowds patiently inch their way to the banks packed with people of all ages. Many queue for boats to float their krathongs mid-stream. The celebration goes on for the whole night with more people arriving in the early hours. Cleaning up the rivers and canals after the festival is a formidable task. On 17 November 2005, the morning after, it took 4,000 cleaners to retrieve 1.2 million krathongs in Bangkok alone! The City administration discourages the use of Styrofoam, as these are non-biodegradable. The more enterprising have baked bread in the shape of krathongs that are consumed by fishes. If you're in Bangkok during the next festival, view the festivities at any of the Chao Phraya river piers. For a panoramic view, book a hotel with a river view. Or take a river cruise by night. As fireworks burst overhead lighting the dark Bangkok skies, another Loy Krathong Festival comes to an end. Meanwhile the krathongs drift along the Chao Phraya carrying with them the hopes of thousands wishing for a better tomorrow. Loy Krathong 2008 Loy Krathong 2012.